Published by Concord Free Press 2010. Rut takes readers to the Rocky Mountains circa 2050, when the once-thriving burg of Gower is about to become a 21st-century ghost town. Thanks to extreme weather and plenty of toxic waste, the skiers and celebrities are gone, along with the money and the veneer of civilization. What’s left? Old-time religion and brand-new pharmaceuticals, bad food and warm beer, mutated animals and small-town gossip. Can the town survive? Read Rut and see. Sly and cool, absurd and archly perceptive, Rut resonates with the best work of Kurt Vonnegut and Thomas Pynchon, all in a wonderfully weird tale unlike any other. 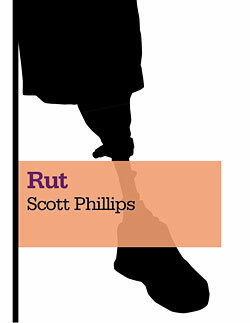 Rut takes readers to the Rocky Mountains circa 2050, where the once thriving burg of Gower is about to become a 21st-century ghost town. Thanks to extreme weather and plenty of toxic waste, the skiers and celebrities are gone, along with the money and the veneer of civilization. What’s left? Old-time religion and brand-new pharmaceuticals, bad food and warm beer, mutated animals and small-town gossip. Can the town survive? We’ll see.